Blue Haven Resort is a family oriented fishing resort, which has been owned and operated by the Acton family since 1972. Blue Haven Resort is located on Lakeshore Drive, just minutes from historic downtown Branson and The Branson Landing. When you have had your fill of shopping, shows, and fine dining in town, you can return to your cabin for some peace and relaxation. Blue Haven has 31 cabins, all of which have fully equipped kitchens. 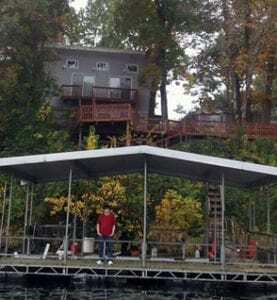 20 of our cabins sit on the bank of Lake Taneycomo, and the others are only a quick walk away. Taneycomo is cold water filled lake with trout, and good fishing is as close as the two docks on our lakefront. Just a gentle slope to the water for fishing or boat riding. 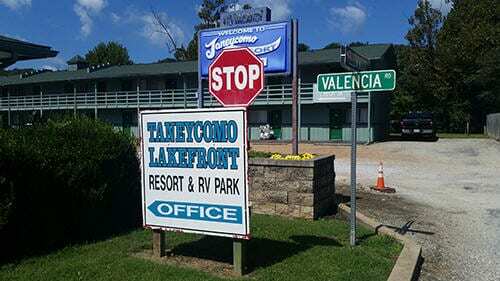 Lake Taneycomo, is 14 wooded acres of campsites and cabins. We are located on the shores of Lake Taneycomo, famous for trout fishing. Cooper Creek is also just 5 minutes from Branson, Missouri’s shows, shops and many attractions. Come to stay and play in Branson. We’re not just for trout fishing anymore. 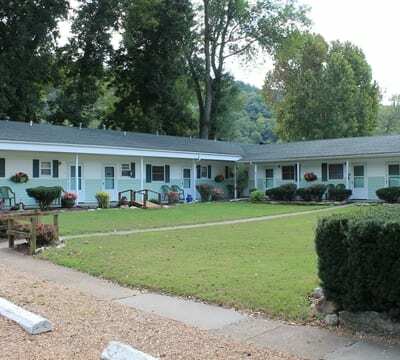 We invite you to bring your family to a piece of paradise nestled along the banks of mystical Taneycomo Lake, in the heart of the Ozark Mountains. Taneycomo Resort & RV Park is the ultimate place to come enjoy nature at its best for a relaxing trout fishing get-a-way while just minutes to the Branson Landing by boat or by car. Recently remodeled and beautifully decorated rooms make Taneycomo Lakefront Resort & RV Park is a MUST stay for your next Branson adventure. Escaping the hustle and bustle of HWY 76, we are at the end of Lakeshore Drive where the trout fishing is at its best. Lazy Valley Resort is a wholesome, family run/owned resort on Lake Taneycomo in Branson, Mo., that appeals to both the young and the young at heart. You can fish for Rainbow or Lunker German Brown Trout from our fishing dock or one of our rental boats. Guide service is also available. Lake Taneycomo is ranked among the top five trout lakes in the nation! If you are excited about fishing, no matter what time of year it is, you will get excited about Lazy Valley Resort! All sizes of accommodations are available, from small kitchenette units, to various sized condos, to our 4-bedroom house. We can accommodate from one person to large groups, and our accommodations are immaculate. All of our accommodations have fully equipped kitchens, are air conditioned and heated, and have color cable TV. As an added bonus, some of the units have decks that overlook Lake Taneycomo. Come and enjoy the view as you grill and picnic overlooking Lake Taneycomo. Branson's Taneycomo Lake houses is two beautiful waterfront vacation rentals. Rent one or both! Branson’s Taneycomo Lake House is a beautiful waterfront vacation rental that is newly remodeled, fully-furnished 3 bedroom 2 bath house that will comfortably sleep up to 8 guests. We are located on beautiful Lake Taneycomo, Branson Missouri’s premier trout fishing destination. The main level of the house features a large fully furnished kitchen and dining room. The living room has a large sliding glass door that leads to the spectacular deck, which is surrounded by trees and has an amazing view of Branson’s Lake Taneycomo. Relax in the living room after a long day of trout fishing, or enjoying the Branson strip, on our large sectional sofa and watch a movie on the flat screen TV. There are two bedrooms on the main level, one of the bedrooms has a queen size bed along with a flat screen TV and the other bedroom has two full size beds and a flat screen TV. The second level of the house is dedicated to a spacious master suite with a California king size bed and separate sitting area with a flat screen TV. The master suite has two sliding glass doors that open to a fabulous deck overlooking Branson’s Lake Taneycomo. The view is simply amazing!! Beautiful one and two bedroom custom built LUXURY log cabins. 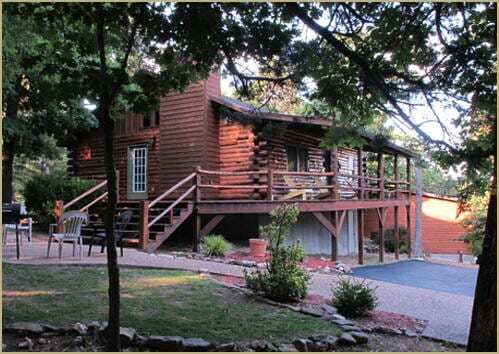 The cabins are located just one mile south of Branson, Missouri tucked away on seven gorgeous wooded acres in the Ozark Mountain Country. Each cabin was built with privacy in mind, our log cabins have private covered porches with own driveway. Lonesome Dove Log Cabins are family owned and operated, insuring an immaculate and refreshing log cabin ready for your visit. As many of our guests have stated it's Branson's home away from home and best kept secret. 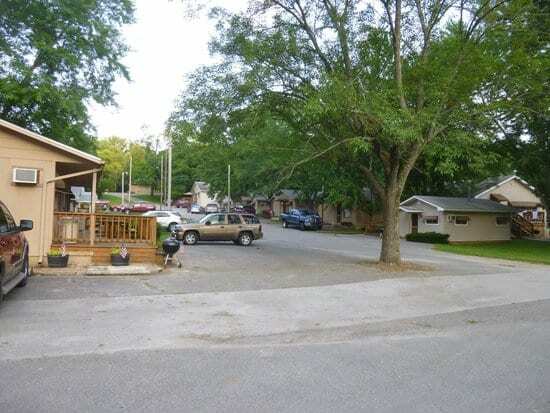 So your Log Cabin search ends here folks, and remember were just minutes from Branson Fun, Silver Dollar City and Fantastic Boating and Fishing of Lake Taneycomo and Table Rock Lake.